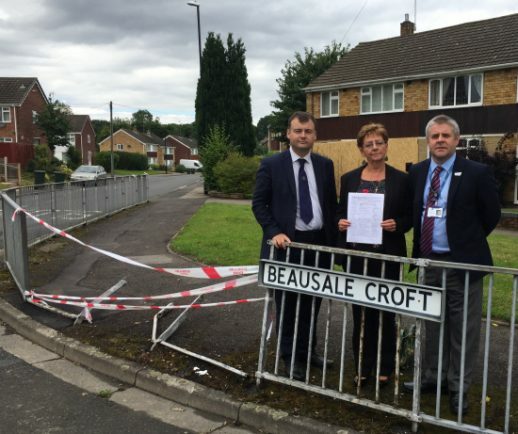 Coun Gary Ridley, coun Julia Lepoidevin and coun Peter Male with the petition at the scene of the crash on the corner of Alderminster Road and Beausale Croft in July. ROAD safety campaigners have forced the council to act amid calls for new signs and markings. The activists secured a partial victory on their demands for greater safety regulation in Alderminster Road in Eastern Green. However, campaigners have warned more needs to be done and Conservative councillors have expressed their support. The council has acted in response to a petition bearing 466 signatures which was submitted by Woodlands ward Conservative councillor, Julia Lepoidevin. It was prompted by a serious accident in July which saw a speeding car crash into the living room of a local resident. The council will install temporary mobile vehicle-activated signs and will refresh existing ‘SLOW’ road markings. Proposed new restrictions consist of double yellow lines at the Beausale Crescent, Ayhno Close junctions and both sides of Alderminster Road between these junctions. Coun Lepoidevin said: “We welcome any measures that will improve road safety in Alderminster Road. “However we need to remember it’s just a step in the right direction. “We need something firmer and more permanent – such as a refuge in the road or at least a permanent speed activated sign. Fellow Woodlands ward Conservative councillor, Peter Male, said: “What we have here is a start, it’s recognition from the council that something needs to be done – however it clearly can’t be the finished article. “I accept there are funding constraints but it’s funny that wasn’t an issue when the Council forked out for Coombe Abbey in secret recently. Woodlands ward councillor and leader of Coventry Conservatives, councillor Gary Ridley, said: “In July a speeding BMW hurtled through a crash barrier and garden wall before smashing into a house – that spectacle must never be repeated. “As such, these measures must be the start of a process to improve road safety – and not the end of one.